This classic tart is a show-stopper. 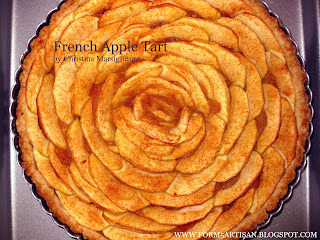 The arrangement of apple slices creates the appearance of a blossomed flower, making it too pretty to slice. Fortunately, it tastes so good that you will easily forget about how nice it looks! This recipe is basically an apple pie in tart-form with a double dose of apples. Thus, it produces the same sort of nostalgic and comforting aromas as it bakes. Although it can be served cold or at room temperature, it is best served warm......accompanied by a nice heavy scoop of Bourbon vanilla ice cream! Once you have pre-baked the crust, increase oven temperature to 375°F and line a large baking sheet with aluminum foil. To make the filling, stir together apples, sugars, lemon juice, 1 tablespoon of melted butter, cinnamon, nutmeg and salt in a large bowl. 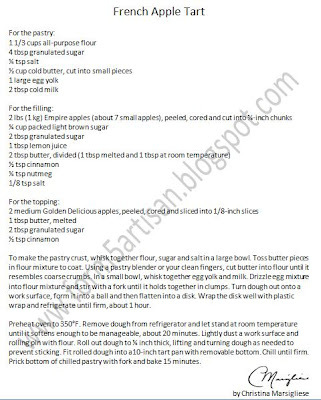 Spread apple mixture on prepared baking sheet and bake until soft, about 20 minutes. Mash the apples using the back of a fork, incorporating the liquid caramel that has formed from the juices during baking. While warm, stir in remaining tablespoon of butter at room temperature. Let mixture cool to room temperature and spread cooled filling evenly into pre-baked crust. 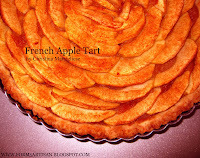 To make the topping, arrange apple slices in concentric circles starting from the outside edge and working your way to the center. Slight overlapping will help to cover filling. Drizzle melted butter evenly over apple slices. In a small bowl, combine sugar and cinnamon and sprinkle over apples. Bake 35 minutes, or until apples are soft and lightly golden at tips. I was one of the luckiest people in the world to have tasted this delectable tart, and this photo doesn't do it justice...you need to have all your senses to thoroughly enjoy it. Beautiful and delicious.